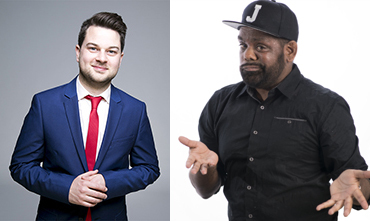 A double comedy act – with Fringe award winners Aboriginal Gigolo Joshua Warrior and Paul Culliver bringing their talent to EP.Black humour is self-deprecating – and one of its exponents is an up and coming strand-up comedian from Adelaide. Josh Warrior has just finished a season of his new act Aboriginal Gigolo at the Adelaide Fringe Festival. Nothing is sacred – his vision impairment, his kids and the missteps of fatherhood. He reckons you’re missing something if you can’t have a good laugh at yourself! Paul Culliver will also share award winning comedy at SALT Shaker. Winner Best Comedy 2016 Fringe World In 12 months, Paul Culliver won Best Comedy at the third largest fringe festival in the world, sold out shows at the Melbourne International Comedy Festival and became the ABC North and West SA Breakfast Presenter.